Cider, also known as hard or fermented cider, is a simple beverage. Cider goes hand-in-hand with images of medieval Englishmen in a pub or colonial Pilgrims drinking from antique porcelain jugs, and is deemed one of humankind’s oldest libations, likely because of its ease of making. When an apple falls off a tree, it begins to rot and wild yeast feasts on its sugars and to create alcohol. Violà! Hands-free cider, ready to drink. Cider, similar to wine, is simple. It consists primarily of fermentable juice from whole fruit and yeast. Unlike wine, it has similar alcohol levels to beer and can be flavored with other fruits, herbs, and spices. Cider is produced in a variety of sweetness levels from dry to sweet, with carbonation levels varying from still to sparkling. Over the years, the category of cider has encompassed perry (fermented pear juice) and other subdivisions. For example, ice cider is cider in which juice is concentrated before fermentation to produce a more alcoholic and acidic cider. If cider is made with a particular region’s apples, such as New England apples, it’s called a New England cider. 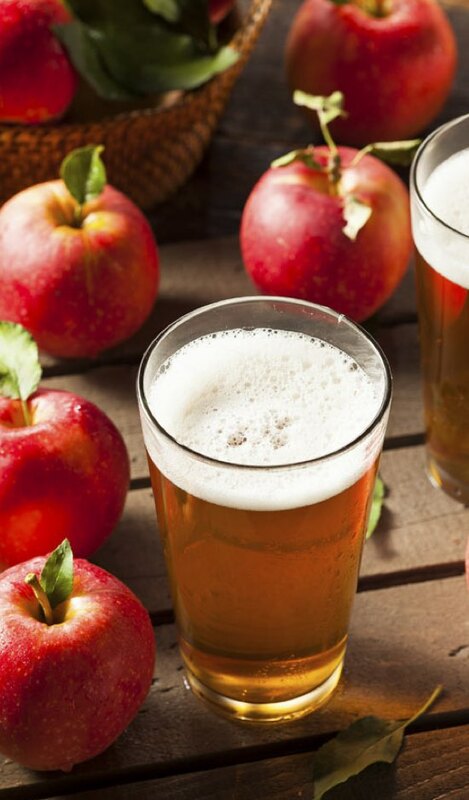 Cider is produced in cideries, similar to breweries and meaderies, and is considered its own beverage category. Cider has history. Although it’s not currently as popular as other alcoholic libations like wine and beer, it’s been around for quite some time. Many cultures in Europe—English, Spanish, French—have consumed cider, with each culture forming its own terroir. The first recorded evidence of fermented cider is from around 55 BCE, when Romans marched into England and found locals fermenting the juice of apples into an alcoholic beverage. Which is, basically, the definition of cider: fermented juice of apples or pears. In early America, cider was a popular drink because it was easier to make than beer and safer for colonists to drink than potentially contaminated water. It was also believed to be an aid to digestion and promote longevity. John Adams routinely drank a tankard of hard cider to start his day and lived to be 91. Just sayin’. The apple juice is the raw material from which the cider is prepared. The quality of the cider depends on the quality of the juice: higher quality apples make higher quality cider. Cider apples are completely different than those available at your local grocery store. Apples can be tart, tannic, or downright inedible. An apple that ruins grandma’s apple pie can provide the complexity and depth needed to make world class cider. While cider apples are categorized differently from region to region, that categorization is always based on a few key elements: sugar content, acidity, and tannin levels. Traditionally, cider apples are sour, bitter, astringent, and not suitable for snacking. But the same tannins that make an apple too sharp to eat make it well-suited for delicious cider. Quality apple juice will have certain characteristics. It should have a high sugar concentration and be low in acidity. The higher sugar content is important because as yeast ferments sugar into alcohol, the overall balance of the cider will be very sharp and acidic if there isn’t enough residual sugar remaining. Not all ciders are the same, as the cider greatly depends on the type of apples used. English ciders are made with bittersweet and bittersharp apple varieties, while New World ciders are made from table apples and wild/crab apples to create a lower tannin and higher acidic cider. 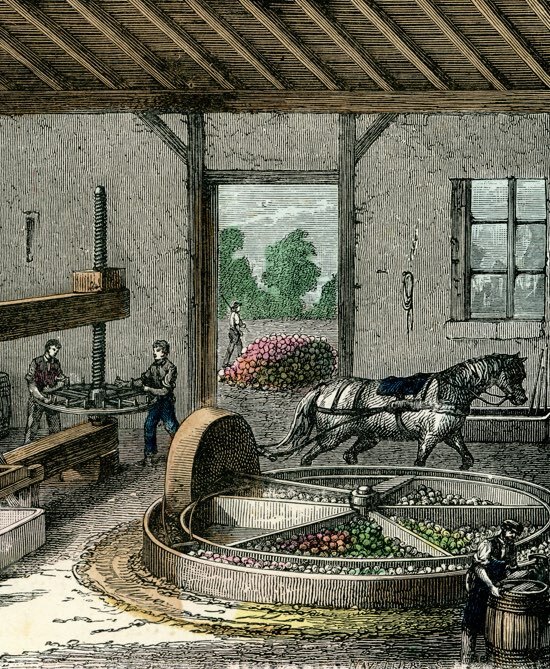 Between the 1600s and 1800s, the British estate owner who made the best cider attracted the best workforce because a significant part of the workers’ wages was paid in cider. It’s a nice thought to savor nowadays, but an 1887 law called the Truck Amendment Act made it illegal to compensate workers in this manner.